PCE Liquid Kids (JPN) "warps" in 08:21.2 by Jaysmad. 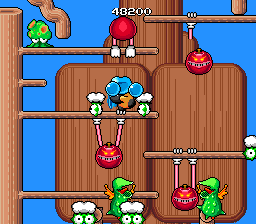 Liquid Kids (known in Japan as Mizubaku Daibouken (ミズバク大冒険)) was released in 1990 on the Arcade and was ported to the PC Engine by Taito, in 1992. This colorful game stars the strangest animal in the kingdom. The platypus... Hipopo journeys through 7 stages to rescue his girl, Tamasun, while saving other friends at the end of each level. Armed with water bombs, he can soak enemies and ride waves to gain a bit of speed. The author, jaysmad, uses warps in order to unite the couple as soon as possible.